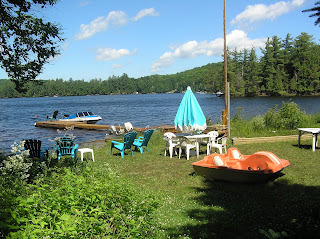 I just came back after spending a week at a cottage. 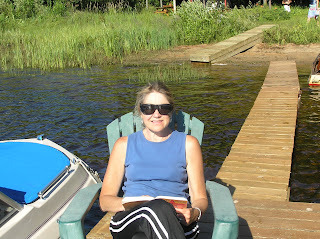 Man, I could really get in the cottage mode all summer! I love the western exposure because of all the great shots you get at sunset. Nothing to get up for except the good coffee! 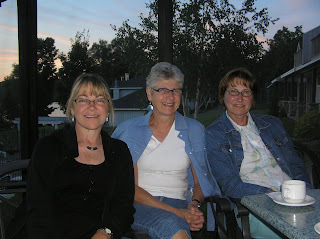 From left, my sister, Joan, my sister, Gail, and MOI. Morning Beach Babes!??? Hags??!! A beautiful sandy beach literally right at your doorstep makes swimming and boating so easy! We went to hear my brother-in-law sing on the porch of a resort nearby. Left to right: Me, Gail, Joan. 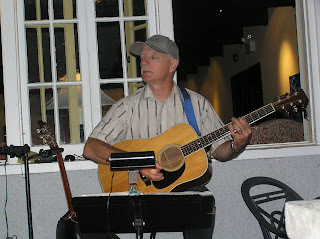 Bill, the one who plays guitar and sings harmony on the song I wrote and sing on this blog! 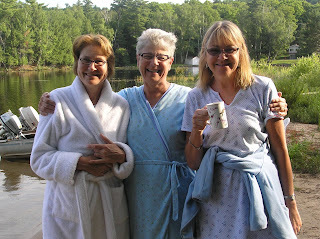 I love our yearly sister-fest at the cottage! Wonderful photos! What a beautiful place to spend time with your sisters. I often stop by your blog just to listen to the song. I didn't know you wrote and sang it! 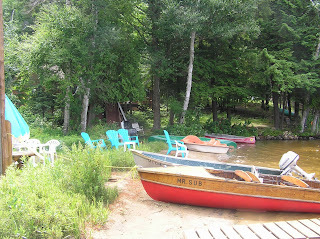 You know I love this sort of cottage vacation and again it strikes me that the nature looks very much like Norway! 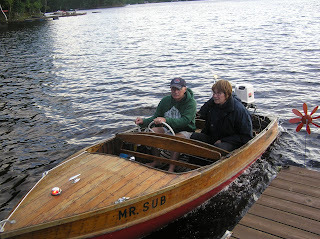 Mr. Sub looks like a beauty - to have a mahogany boat is a treasure you know! You know I love that song and I'm sure Bill played it very nicely! Looks like a fabulous vacation. Dreamy...a cottage, a good old wooden boat and music. I just love having a guitar around to sing along with good friends on a warm summer night. You are right about the sunsets..the first one is really incredible!! I understand so well you love these annual meetings in the nature. You must have had a blast of a time in these beautiful surroundings. As a Norwegian, I'm born to love the nature. And I'm happy to meet blogger friends that also knows how to use and prize our nature. How nice to hear from you. Those photos depict a wonderful time! Yes, our church choir will start up again in August, I believe. Our Sweet Adelines chorus had three weeks off in July, and now we're back to learning new music for our show and this year's competition. I hope you're feeling better than you were the last time you wrote. Looks so lovely, great shots - and lovely to see what you look like too! Gorgeous smiling eyes! Ohmygosh! 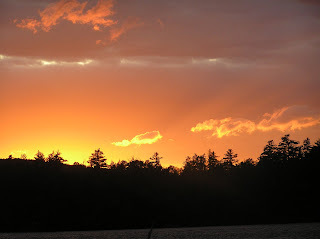 What breath-taking sunsets!!! How fun to spend time with your family like this … thanks for sharing the photos of you with your sisters and the BIL who wrote the beautiful song you sing here. What a wonderful yearly tradition!!! Hi MOI! As I read, this saying 'sisters are forever' flashed -- how true when I see these pictures. What a wonderful way to renew ties and enjoy the gifts of nature! A grand way to spend retirement years? Oh what a great post and pictures MOI, you and your sisters look wonderful! 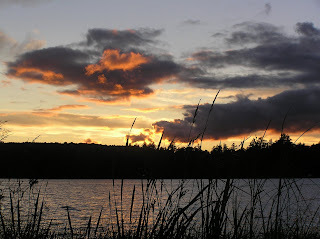 I love the sunset photos too, what beautiful scenery you have there at the cottage. It sounds like the sister-fest was lots and lots of fun! What a great post and fabulous pictures. Looks like you had a great time. great to see you, and you are a beach babe! Great sunset shots. Must be a theme this week as I also posted sunsets from my vacation. See great minds think alike. This is you singing? Are you kidding me? It's awesome! As is the writing! Glad you had a great, relaxing vacation. I also wish the whole summer is like this. It was a pleasant surprise to see your comment on mine. :) Hope you are doing well. I have cut back on blogging. Hopefully will get back to it sometime in the future. I love these photos. Seems like you had a grreat time. Youve made me long for my sister. wow, looks like you had a great vacation at a very beautiful place! Nothing like family gathering indeed. What a lovely group of siblings! I so wish I could vacationed where you were. It's so beautiful. What a heavenly place to relax and enjoy time with family and friends! The mahogany boat is SO cool! Prayers and positive thoughts for resolution of your heart problems.